Shearling coats (or also known as sheepskin coats) are a worth-investing essential in any winter wardrobe, especially this year because shearling coats are on trend now. However, with novices, might you be shocked a little bit after jumping out there on the market, picking one satisfying shearling coat and right when you take a look at its price tag. Yeah, for a genuine high-quality sheepskin coat, it’s usually ranged in price from $350 to $3500. I’m not joking! Sheepskin is one of the most luxurious materials in the leather world. However, in turns, it gives you a super great longevity, softness, comfort, lightness and warmth. The more expensive the coat is, the thinner the leather is yet the warmer it also is. 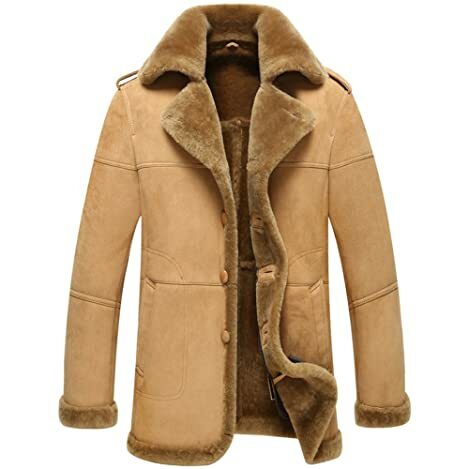 I myself still recommend you to going for a genuine high-quality shearling coat because it can serve you for years, which is a good economic investment in a long term. Besides, this is a timeless piece. But, I also understand that some people have tight budget which only enable to afford for fast-fashion to mid-tier products. Don’t worry, I don’t force you to go for an expensive garment to be a fashionista this winter. I’m here to exactly help you choose the most suitable shearling coat for men to not only turn your stylish mode on, but also keep you warm. That’s why I divide this collection into three different price ranges: the fast fashion, the mid-tier and the high-end. Also, a good news is all of them are high-quality compared to its price, and come in reliable warranty. So, read on! Actually, to point out the main difference between these three levels of range, aside from the price tag, it’s mostly the material. With fast-fashion, these shearling coats are mostly made out of jeans, cotton, or blends of cotton and polyester with inner faux shearling sheepskin while the mid-tiers are crafted from faux leather or PU leather. In terms of the high-end, of course, they are made out of high-quality genuine sheepskin with real shearling. Their quality, texture and hand-feel are totally in a different range that is way more durable and long-lasting than other ranges. Now, speaking of the fast-fashion shearling coats, there are 4 reliable companies that I super highly recommend are Levi’s, Xelement, Wintie and Vcansion. Actually, Vcansion has released a lot of winter shearling coats for this winter, but I highly recommend you to try this model because I personally think it’s the most versatile, practical, functional and aesthetic. As I told you above, most fast-fashion shearling coats are made out of cotton and polyester. This one isn’t an exception to cutoff as much manufacturing cost as possible to afford a tight budget. However, its material is quite good, if not saying that it’s super soft, flexible and warm. Don’t worry, it still allows you to machine wash as well. Just remember to air dry it naturally only, don’t go for tumble dry unless you want to buy a new coat. With polyester lining and the faux fleece lined, it can keep you comfortable, fashionable and warm in cold days. However, in super chill weather, it’d better to layer more sweater/hoodie or t-shirt. This shearling coat also gives us two large sided pockets that’s enough for a smartphone, a wallet or just your hands. Moreover, there are two chest pockets for decoration or you want to take advantage them for some extra storage space. But my favorite is its inner pocket where I can toss in some money or small change in case I forget to bring my wallet along in a hurry. As a unique decoration, the embroidered logo on its chest and arms are great to easily make you stand out from the crowd. A good news is this coat is US sized so that you don’t need to consider going one size up or down like the Asian-size shearling coats. This Wintie Shearling Jacket is super casual that you can style in various occasions, from daily use, hanging out to shopping. It’s also great to keep you warm in winter due to the high-quality cotton material and classic fit silhouette to trap natural heat from your body better. Besides, it’s extra faux turn-down shearling collar helps you neck against chill temperature on the outside, which you needn’t wearing a scarf at all. I like its navy-blue denim fabric on the outside. It’s much tougher than other materials for better protection and warmth keeping. Besides, its outlook is much cooler and outstanding, especially the colorway. Like the Vcansion, this one comes up with two large sided pockets and two button-fasten chest ones that is enough to carry your essentials along without needs of a bag. There’s just one thing you should consider about this shearling coat is its size chart. As Wintie is an Asian company, its size chart might be a bit different from the US’s. You should ask the manufacturer clearly to make sure the most suitable size for your body. Besides, if you don’t like this navy blue, just take a speak at their color table where there are up to 5 other options. I’m sure you will pick the most favorite out of this bunch. Compared to other shearling coats in the same price range, this Xelement design is outstanding because it’s crafted from 100% genuine sheepskin shearling. So, you can confidently show off this coat and tell the others that it’s real shearling. Particularly, I bet they will be freakily amazed after knowing its price tag. For such high-quality material and good making, this coat truly bangs for your bucks, which is worth a try. Like other fast-fashion shearling coats in this collection, this model is casual and great for many occasions like parties, hanging out or daily use. With extra faux-fur lining on the interior, you will get extra warmth to survive these cold days. On the other hand, thanks to its adjustable belted straps on the side and on the hood, its warmth keeping ability is upended significantly. By the way, the hood is removeable for convenient use. You can attach it to the shearling coat to wear on snowy days and detach it when it’s nice weather. 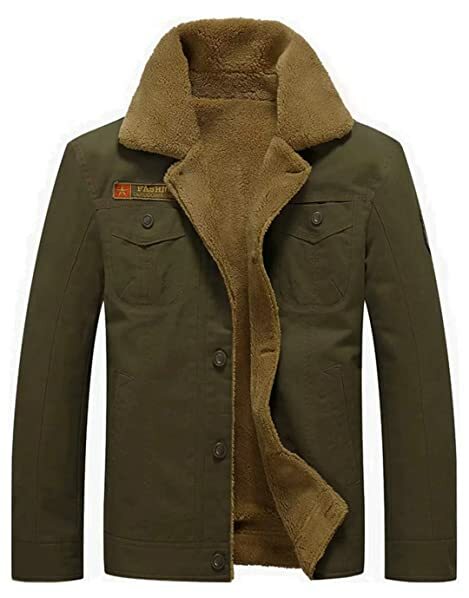 This mens shearling coat with hood features a slim-fit silhouette and even though its cuffs aren’t ribbed like other winter coat, thanks to the inner fur lining, they “hug” nicely to your wrist and are even warmer and more comfortable. Like Xelement shearling coat, this Levi’s jacket brings a unique vintage look to perfectly match many casual occasions like parties, daily use, going out and shopping. 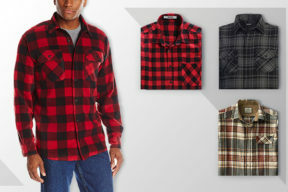 However, its material is cotton blends – 33% polyester and 67% cotton to deliver more comfort than the denim or cotton. Besides, the fabric texture is way more flexible and lightweight. It’s machine washable by the way and can dry out quickly. I love the button-front design combining with faux-shearling spread collar for an ideal cool casual look. Featured as a slim-fit shearling jacket, there’s button cuffs and adjustable tabs at waist to make the coat itself fit to your body shape the most. Plus, there are two flap chest pockets and two welted hand ones for extra storage and coverage. Now, speaking of its warmth level, I myself feel this coat is a bit less than other shearling jackets in this collection, which means it’s only perfect for those cold days. On snowy weather or freakily chill temperature, I highly recommend you to wear gloves and a scarf as options. Besides, layer more for best warmth. Such as an elongated shirt inside a sweater, a hoodie or a flannel shirt and then, wear this jacket. With that mix and match, you will not only stay cozier, but also look more stylish and fashionable. In terms of mid-tier shearling coats, two favorite brands that I have been sticking to for years are Fjackets and Blingsoul. They are both well-known brands that I personally find their products are truly high-quality for the price. Of course, the material is leverage to PU leather and full lining with faux shearling. But, some of them is highly invested with genuine sheepskin, which I also list here. Moreover, Fjackets and Blingsoul provide 30-day warranty for each single shearling coat to ensure you buy it with confidence. 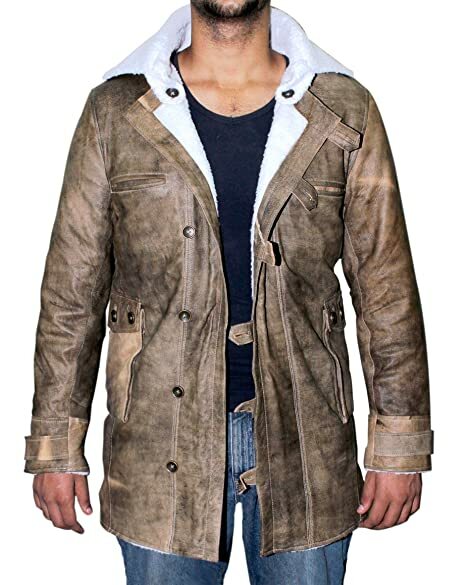 Start off with this best mens shearling coat from Fjackets! The highlight about this garment is its hand-picked quality material to ensure the most comfort, warmth and functions to users, though it’s just PU leather. Featured as a long, moderate slim-fit jacket, it does bring a boss feeling, which is luxurious, cool and super masculine to also perfectly a present in Christmas or other special occasions. If you are wondering about its durability, due to the manufacturer’s claim, it can last for years. I myself can’t assert that issue, but up to now, after 9 months of use, mine doesn’t show any signs of wears and tears yet. Quite satisfied! And as I mentioned above, there’s a reliable guarantee with full refund or new replacement for any detected products. Don’t worry, their customer service is quite great and fast. They will respond to you quickly and sincerely give you advice or help on something related to your experience on their product, which is a great bonus. 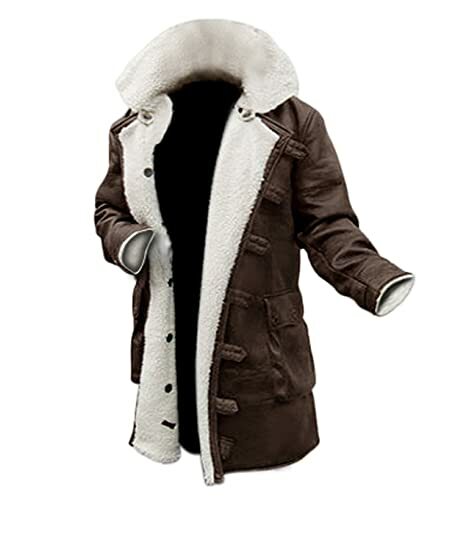 Like other shearling coats, this model comes in two sided pockets, two chest ones and particularly, a functional zipper. But, one thing you should keep in mind when picking this shearling coat is it’s designed to be versatile uses. I mean you can use it either in summer or winter with most comfort. So, I highly recommend using this only on cold days. On the snowy, let’s layer more or simply, consider the Blingsoul’s because their jackets are designed to bear sub-zero temperature pretty efficiently. As mentioned on my article about “How to Style in This 2018 Fall”, striped, checked and plaid patterns still dominate men’s fashion world, which is the reason I added this flannel shearling coat to my list. It’s truly a versatile garment that can take the role of a flannel jacket to style many streetwear outfits, but also a winter coat to keep you warm. If you layer this with a winter hoodie and a basic shirt inside, it’s more than perfect. Speaking of functions, two features in this shearling coats make me crazy are its interior pockets and the full zip-up closure. Of course, you will get two large outer pockets for your hands or other less important, regular stuff. But these two hidden ones are super practical and secure to keep my smart phone and wallet flatly and comfortably against pickpockets. And the zipper, it saves more time than the front button fasten design. You will feel how convenient it is if you’re living a busy life with regular hurry moments when preparing to go out. The front button-fasten jackets not only take more time from you, but also sometimes make you go crazy. Another thumb-up is its large size chart, from x-small to 3x-large to make sure you can find the most suitable one for your body shape. But, my personal advice is going one size up for the best fit because they are Asia-sizes. In case you unluckily pick the wrong size like I used to, feel free to contact the vendor, they are really easy to work with and helpful by the way. With less than 146 bucks, this shearling coat is from BlingSoul. 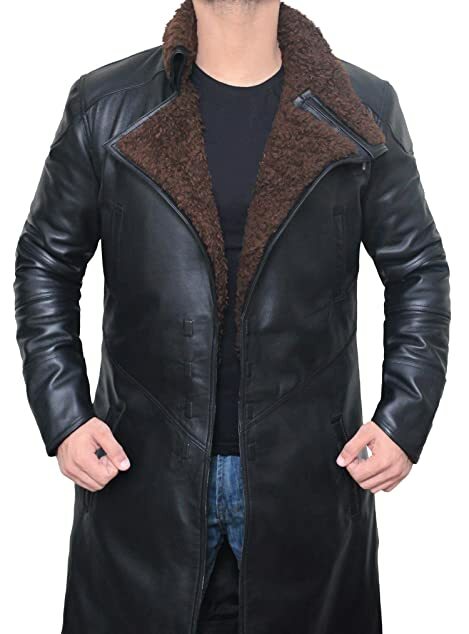 Now, this features a long silhouette with nice coffee brown color and stand collar, which I usually call “the boss shearling coat” because it looks no different than a typical jacket with luxurious look, worn by a wealthy boss that is usually seen on TV. On other words, it’s eternally cool with high-quality faux shearling lined, front button-fasten design and broad collar that can be set folded and stand up. It’s one of the jackets that is iconic, luxurious and looks always amazing. However, typically, you do kind of get what you pay for (for most brands) and these things don’t come cheap. I was quite surprised by the quality of this coat made out of PU leather and faux shearling inside. Not only look cool and wealthy, it keeps me warm efficiently in sub-zero temperature. Plus, it’s breathable and comfortable – really butter soft in my opinion. Also, it’s quite durable, not only based on the premium material, but also the re-enforced stitching on the front straps. In winter, I’m going to wear a lot, but after three months of use, not find out any signs of wears and tears yet, which is really appreciate. Some people seem to look down on PU leather but I myself find it’s a strength because you don’t have to pay much money and effort to maintain it like the genuine. It’s perfect if you’re living a busy life. And, its texture feels much like genuine leather. If you love layering clothes, I advise to go one size up for the best fit. Otherwise, just go true size. Wearing it as a jacket or a costume isn’t a matter at all. Next, we have this guy, also from BlingSoul. However, it’s more vintage and Swedish-alike look than the above one. Particularly, this shearling coat is made out of 100% genuine leather as the outer layer and fully insulated and lined with faux shearling fabric. Right because of this material, it can reshape after wearing. Plus, it’s stretchable efficiently to deliver various form fitting. This is a huge plus point because unlike other materials, you need to consider carefully which size to go to. Also, this shearling coat gives great drapes and good movement as well. I personally like its finely grained and buttery texture, which is quite unique and on point. 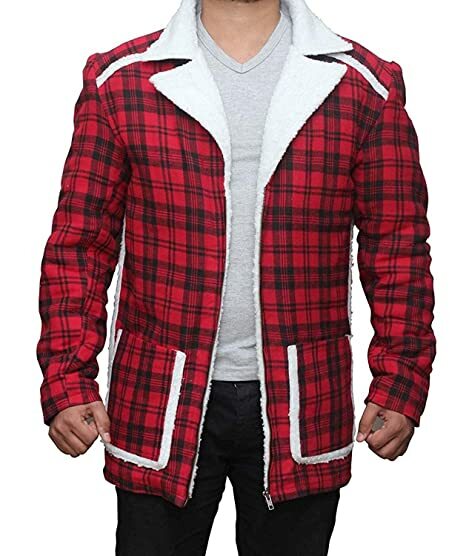 In comparison to the previous model, the warmth of this jacket is much the same – save you from sub-zero temperature, like from -10°C to -20°C Celsius. Besides, you will get two flapped pockets at waist, two chest pockets and two hidden ones on the inside for essential stuff like wallet, important document or smartphone where pickpockets can’t approach them. 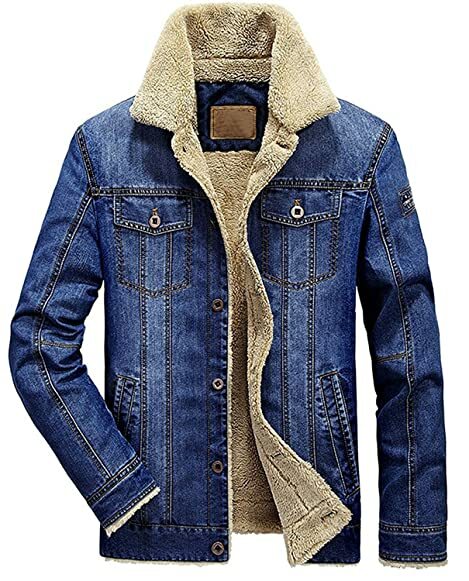 I’d like to style this amazing jacket as casual garments with jeans, flannels, t-shirt or plaid pants. Overall, if you are finding a vintage, unique leather jacket which is of incredible quality at a reasonable price range, this garment is just made for you. If such benefits don’t persuade you yet, its guarantee with 100% money back will surely encourage you to hit that “Buy” button. Well, I’m a little bit biased to the high-end shearling coats with up to four recommended brands which are equivalent to five different suggested products. Why I advise you to go for an expensive shearling coat (if you can afford it) is not because of its luxe, but also for the value, durability and the true vibe of a shearling jacket it does bring up to you. As I said above, you’re going to wear it a lot in fall and winter with a lot of beats and abuses. Besides, all high-end shearling coats are made out of premium genuine sheepskin, which means the more you use it the better it will be. This adds soul and unique vibe to your outer look as well as more like a statement piece of your fashion taste. So, let’s take a peak at these five high-end shearling coats to see how much it bangs for your bucks. I’m beginning with this one – my lowest price point. It’s from Infinity. Now, it’s an aviator jacket which looks so cool and amazing. It’s crafted out of 100% high-grade sheepskin with full sheepskin lining on the inside, reversible cuffs and collar, waist adjuster sided buckles and one buckled neck strap. This shearling coat is one of the most iconic jackets I’ve ever tried. And, it’s minimal in design with only two front pockets to keep your hands warmer in colder days. With the collar, you can pop it up to be chiller, or drop it down as casual look. Due to its cool, masculine and wild outlook, I think this is a perfect garment for motorcycle outfits. You can style it with black jeans or ribbed jeans and a t-shirt under it. Now, to answer the most popular question “Is it worth the price?”, I think it’s actually really amazing. Though made out of genuine leather, this dark brown jacket is coated with an oil layer that’s efficiently water resistant to save you from complicated maintenance process. There’s just one thing you should keep in mind when choosing this jacket is its size chart. For the best fit, let’s go one size up. These are harder to layer because of its thick lining – quite fluffy. If you wear a jumper, it can sort of start making you feel really padded and full. Just one t-shirt underneath is okay. And thanks to its warmth, I think you should be comfortable. Up next, we have this guy from Brandslock. Speaking of this brand, it’s a well-known company that is also one of my favorites amongst the bunch because of its unique, luxurious style, especially the original and authentic British tanned skins that hardly you can find out the second brand. 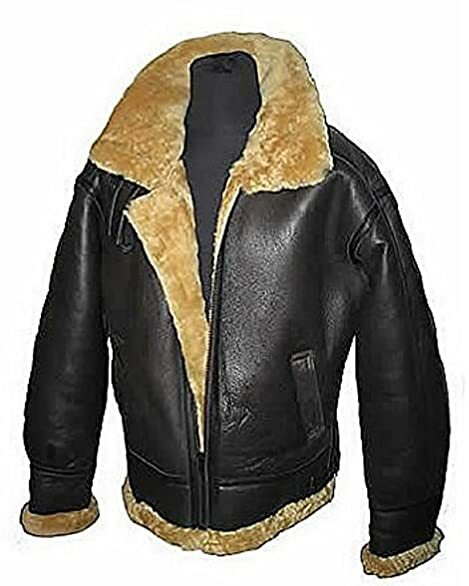 Another great bonus in this men’s genuine shearling sheepskin leather jacket is its hardware. I mean this full zip-up that is made out of heavy-duty brass zipper. You can feel its quality even from the sound it makes when you pull it up and down. This is something you can’t beat. Aside from the outer layer of 100% sheepskin, its interior is made out of soft-touch 1-inch wool throughout Napa lamb finish. 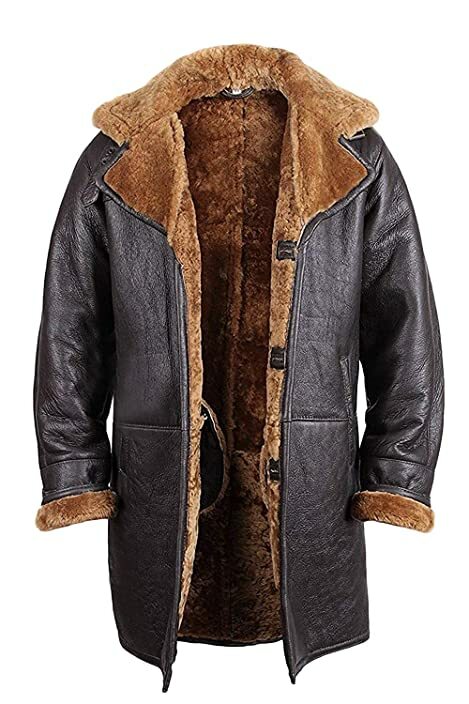 The leather material is extremely incredible conditioned and soft on this coat and the sheepskin covers the whole interior to deliver the best warmth ever. I also like the way this United-Kingdom-made jacket fits to my body as well. If you are a tall and big guy, don’t fret, there’s surely a size for you because its size chart is up to 5x-large. Impressive, right? If you’re not sure which one to go to, just ask the manufacturer for sincere advice, you will be amazed by their good customer service when buying this product. Differ from other high-end shearling coats, this design allows you to choose from three different shearling color: black, brown and white. In my opinion, this jacket is well worth my bucks so far. Mine is a black mens shearling coat and it’s awesome! Again, this shearling coat is from Brandslock. However, it features a long boss-alike design with regular-fitted style to perfectly style in many special occasions like business trips, appointments or wealthy parties. Like the previous brother, this is crafted from 100% original and authentic superior quality sheepskin leather and shearling with inside clean cut to bring a nicely sleek and chic outlook. I’ve just got this bad boy for a couple of weeks so, no comments on its durability or longevity. However, based on the material texture and hardware quality, I don’t see any wears and tears on it yet. Why I love this long shearling coat is not only its cool outlook or top -quality finish, but also the benefits it does bring to me. For example, you can wear three buttons up, toss your hands into its warm and soft pockets (they are in reasonable positions to place your hands comfortably. I mean you don’t have to fold your arms so highly to enable to toss it in these pockets like other annoying jackets) or get extra coziness from the interior wool. Like the Infinity, the size chart of Brandslock is quite huge, from x-small to 5x-large to ensure you will find the most suitable coat for your body shape. Speaking of this LINAILIN shearling jacket, I am 100% satisfied with it. The way the manufacturer takes care of every single details from A to Z will ensure that you are going to get what you expect for. 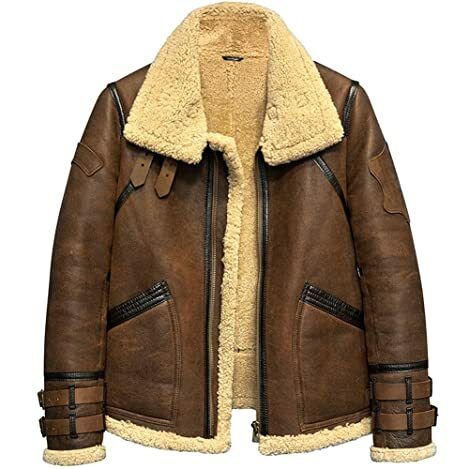 Particularly, you can have this expensive shearling coat custom by privately email the manufacturer, giving them your requirements on your desired coat and negotiate the price. But don’t worry, it’s truly worth the price. I have never seen a shearling coat with such smooth and soft texture like this one, even compared to the Italian-made products. It’s something unbeatable, guys! Out of such amazing outlook, you will also be satisfied with every single detail, even the stitching, like buttons, the lining, the inner tag, the hidden zippered pockets and so on. 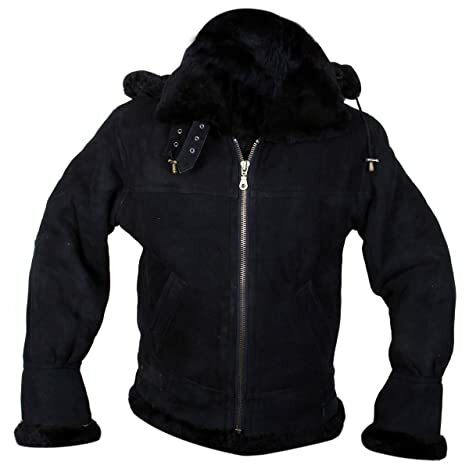 The whole jacket is made out of 100% high-quality genuine sheepskin with exposed shearling notched collar. You can pop it up on the chillier days or place it down for more casual look. Due to the material, it isn’t heavy at all, if not saying that it’s quite lightweight. However, I consider it a little bit fluffier than regular fitted silhouette. From that point, it’s better to wear a t-shirt inside. No layer! Last but not least, it’s this shearling coat from Denny & Dora. I’m always a loyal fan of aviator design because of its energetic, youth and wild vibe. 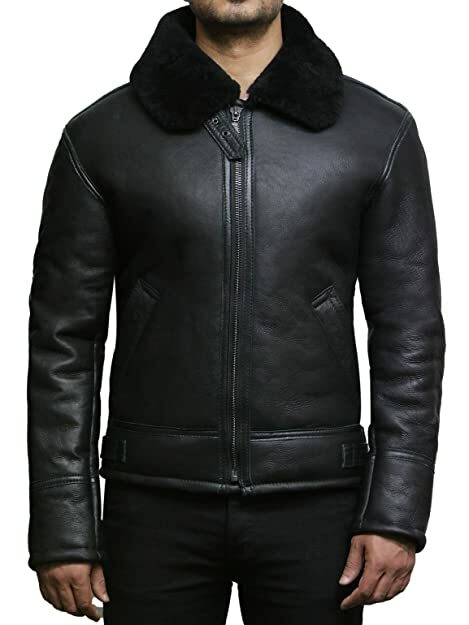 Compared to the previous aviator shearling coat above, this high-end one will give you a total difference, from the feeling touch of its material to the warmth and benefits. Like other expensive jackets, this one is crafted entirely from imported genuine sheepskin with lamb fur shearling fabric. Featured as a full zip-up closure and exposed shearling cuffs and hem, its coverage and closure ability are totally no joke. Even in sub-zero temperature, it’s sure to keep you warm yet breathable and comfortable. Besides, you can dress up or dress down with this garment based on its unique luxurious outlook. The more you use, the better its leather texture will be. No doubt, this is a statement piece in your winter closet to style in any occasions, from parties, hanging out, traveling to business trips. There are also two opened sided pockets to toss your hands in and a hidden one on the inside where you can put some small changes or regular cards without fears of pickpockets. Like LINAILIN, this manufacturer allows you to order a custom jacket, which is the sort of thing you pay the extra for. Overall, it’s just great. I love it to pieces! Yeah, that’s the end of this article. I hope you find my rounded-up list of 13 best shearling coats for men is useful. Or at least, inspired you to find out the most suitable style, design and budget to go to. Speaking of price range, I know it’s a little bit irrelevant here because you work hard to afford what you need. But this piece is going to be styled regularly with you in half of a year so, I would like it must bang for your buck, whichever coat you go to. It’s more likely an investment, so, hope you make it worth the value.